Â Panettone is a sweet yeast bread that originated in Milan, Italy. Served most often at Christmas, though it is also baked for other occasions, the tender bread is baked as a tall round (either a cylinder or an octagon) and filled with things like raisins, candied citrus and nuts. Sometimes the bread is spiked with a bit of rum or another liquour, or else the fruits might be soaked in it before being added to the bread. It is good eaten plain, but if you want to get fancy it can be made into a decadent version of french toast or bread pudding. Really rich doughs, heavy in butter and eggs, are often sticky and require more rising time than other yeast breads, but it is no more difficult to make panettone than other yeast breads. The only thing you may actually need – other than a bit of practice – is a special mold to shape your loaf in. But I don’t need a special pan that is used for baking only one loaf of bread and, even though I like working with yeast bread doughs, I certainly don’t want to spend more time in the kitchen around the holidays than with my friends and family. So, I adapted a recipe for a bundt-pan babkaÂ into a no-knead, quick rising Bundt Panettone. The panettone comes out in a ring, which is somewhat untraditional, but tastes delicious. It is quite sweet and very, very tender – nearly cake-like – in texture. It can be toasted, but pairs perfectly with coffee on its own. I opted to only use raisins because I am not a fan of candied fruits in bread, but I had some large pearl sugar (substantially larger than even coarse organic sugar and available in Swedish and specialty baking stores) that I stirred into the dough before baking. After being baked, the bread is lightly soaked in a sugar-rum syrup to make it extra-moist and give it a final flavor boost. Add in milk and very soft butter and beat mixture for 2 minutes at medium speed. Mixture should be smooth. Add in eggs, one at a time, waiting until each has been fully incorporated to add the next. Add in an additional 1/2 cup of flour and beat for 2 more minutes at medium-high speed. Stir in remaining flour (creating a thick batter), then cover the bowl and let rest for 10 minutes. Stir in raisins and pearl sugar, if using. 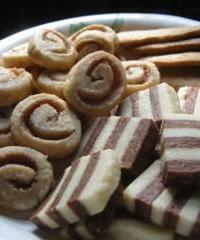 in candied fruits and raisins. Pour into prepared bundt pan, cover and let rise in a warm place until doubled in size, about 1 1/2 hours. Immediately pierce the surface of the bread multiple times with a skewer or a long fork. Pour hot rum syrup (recipe below) over bread and allow it to soak in. Let stand for 15 minutes, then remove bread from pan and cool completely on a wire rack. Sift a bit of powdered sugar over the panettone before serving, if desired. In a small saucepan, combine sugar, rum and vanilla extract. Cook over medium heat, stirring until sugar dissolves. Bring to a boil, then remove from heat and pour over baked bread. 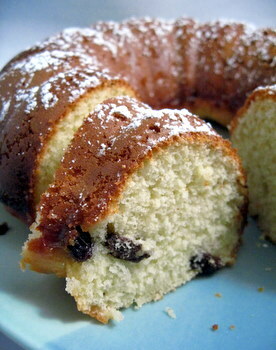 What a great idea…Panettone as a Bundt. This sounds really easy and tasty. I shall have to try it soon! This Panettone looks so deliciousâ€¦bookmarking it for next Christmas!